A capacity crowd of racing industry supporters, Hall of Fame honoured members and incoming inductees were expertly guided through a jam packed agenda by Master of Ceremonies and CHRHF Honoured Member Jim Bannon during Wednesday evening’s annual Hall of Fame President’s Reception. The proceedings fittingly began with CHRHF President John Stapleton reflecting on the success of the 250th Anniversary of Horse Racing In 2017, one of many projects he spearheaded during his time as president, a role he has held since 2010. Stapleton then announced the person succeeding him as president of the CHRHF will be Darryl Kaplan, manager of Industry Communications at Standardbred Canada. John’s summary of Kaplan’s biography with the Hall of Fame included the following: “Darryl Kaplan has been closely involved with the Canadian Horse Racing Hall of Fame for several years. He has been Chair of the Nominating and Legends committees since 2011, and is a longstanding member of the organization’s Planning Committee. Canadian Horse Racing Hall of Fame outgoing president John Stapleton congratulates Darryl Kaplan as the next President of the CHRHF. Over the past decade, Darryl has dedicated great time and efforts to promoting the Hall, and has been a true asset in initiatives that advance the prominence and presence of the Hall. He was an important part of the team that ensured the Hall of Fame took centre stage during the 250th Anniversary of horse racing in Canada. Prior to his position with Standardbred Canada, Kaplan worked at Woodbine Entertainment for five years, primarily on the thoroughbred side. He continues to have many contacts and close colleagues across all breeds of horse racing. As he accepted the new title and role, Kaplan’s passion and commitment for what the CHRHF represents was evident in his remarks. “I am truly honoured to take on the role of President of the Canadian Horse Racing Hall of Fame. On behalf of the entire Board of Directors, I wish to extend a sincere thank you to John Stapleton for his tremendous leadership as President over the past 8 years. 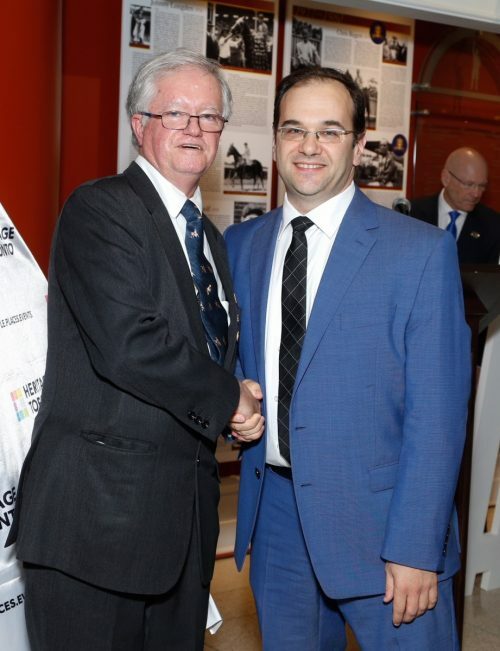 Toronto City Councillor, Ward 13 and Lou Cauz, Director Emeritus, Canadian Horse Racing Hall of Fame. 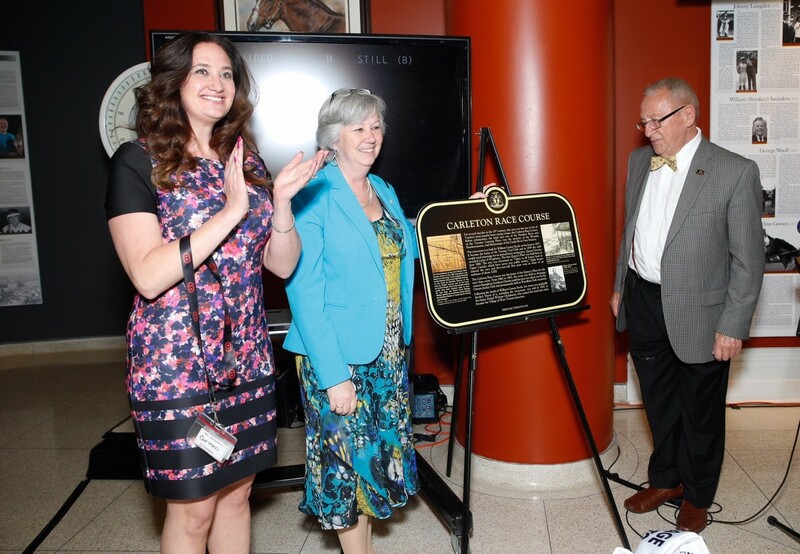 The next order of business was the unveiling of a Heritage Toronto Plaque to be installed on the site of the first Queen’s Plate race held at the Carleton Racecourse in 1860, located in the area of Toronto now known as the Junction neighbourhood. The commemorative plaque, which is jointly funded by the City of Toronto, Woodbine Entertainment Group and the Canadian Horse Racing Hall of Fame will mark the founding location of what is now the longest continuously run stakes race in North America. The official installation of the marker will to take place July 19, 2018. The Hall then paid homage to the 2018 Legend Honourees, the late Frank McMahon, and the late Hector Clouthier, Sr. Present for the ceremony were 30 members of the Clouthier family, including all ten of the late Hector Clouthier, Sr’s children. 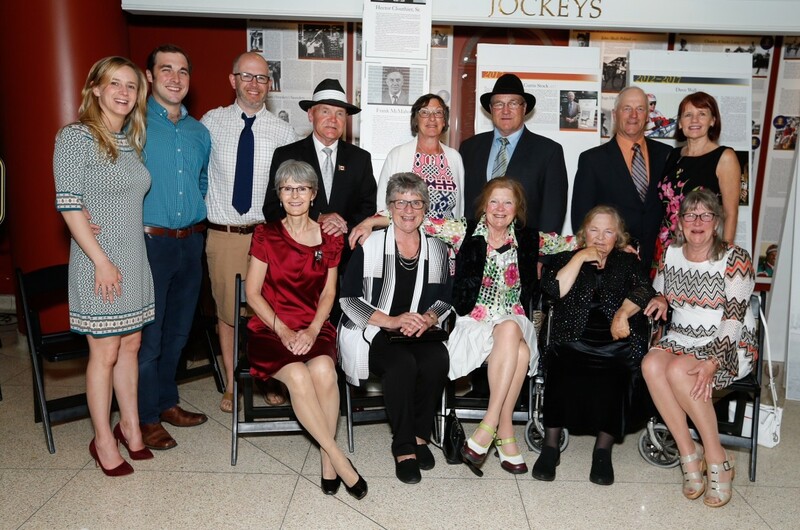 The late Hector Clouthier, Sr was well represented by his children, grandchildren and extended family members for the unveiling of the display panel acknowledging his enshrinement as a Legend Honouree in the Canadian Horse Racing Hall of Fame. Speaking on behalf of the family, Hector Clouthier, Jr. recounted stories and reflected on his father’s life, touching on a passion for horses which began as a youth working in the family’s lumber business, and continuing in his Standardbred breeding and racing operation under the “Northwood Stable” name. However, Mr. Clouthier’s greatest contribution to Canadian horse racing occurred once he became involved in racing industry associations, sitting on the Board of the Canadian Trotting Association, the Canadian Standardbred Horse Society, and the Ontario Harness Horse Association. He was considered one of the founding fathers of organized horsemen in Ontario, helping to negotiate contracts enabling horsemen to make a career in the racing business. Clouthier was recruited by the Quebec based United Harness Horsemen’s Association, became the organization’s President, and was soon thrust into contract negotiations with the powerful Jean Louis Levesque, owner of Montreal’s Blue Bonnets Raceway, to resolve a horsemen’s strike over purses. The evening concluded with the unveiling of the permanent display panels for the 2017 inductees and the formal introduction of the 2018 inductees: Standardbred Builder, William (Bill) Andrew; Thoroughbred Trainer, Reade Baker; Standardbred horses, Blissfull Hall and Chancey Lady; Driver/Trainer, the late Jim Doherty; Communicators Dave Landry and Dan Loiselle; Thoroughbred horses Judy the Beauty and Shaman Ghost and Thoroughbred Builder, John G. Sikura.